The Duo Copper Vac Bottle & Tumbler 22oz is the most innovative style of the year. 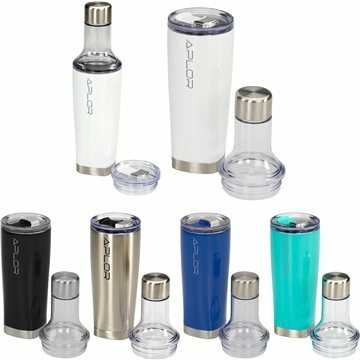 Enjoy a beverage by drinking through the tumbler which has a screw-on lid with slide opening, or a bottle with screwed-on top, closed with a stainless steel lid. Durable, double-wall stainless steel vacuum construction with copper insulation, which allows your beverage to stay cold for 24 hours and hot for at least 8 hours with the easy sipping lid. Wide mouth opening for easy cleaning and filling ice cubes.